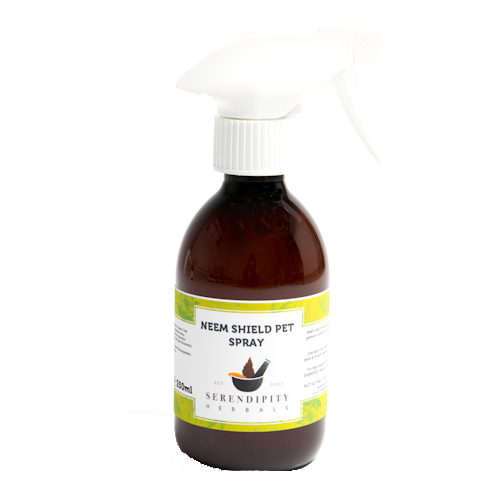 Neem Shield Pet Spray has a powerful natural formula that harnesses the intrinsic properties of neem to improve coat condition, freshness and the general comfort of your pet. Apply a light spray mist daily, or as needed. Best used in conjunction with NEEM SHIELD PET SHAMPOO. Sore or irritated areas may also benefit from the application of NEEM SHIELD CREAM or PURE NEEM OIL. Only used this a couple of times at the moment. I've used this when my dogs sore skin has been irritating her too much. She doesn't like it and tries to hide when I get it out but it instantly stops her licking and chewing. I love the smell of it too. In 4 weeks of using this product my Puppy who was diagnosed with demodex mites has all her fur back again and she is the active happy puppy she should be. I spray it on her twice a day. Yes it does smell a bit but id rather smell that than treat her with chemicals from the vet that made her very ill. Great customer service also . Excellent stuff. My Border Collie was itching after every walk in the woods and fields. I use this spray before each walk. Spray feet and up legs, along the body, front back and sides. He no longer itches and have not found any ticks on him. Really good stuff. Dog is used to being sprayed now but does not like it that much and at first rolled all over the grass to get it off! As usual another excellent product in this range for dogs. I spray all 6 before we go out and coupled with their daily dose of Billy No Mates we are thankfully keeping on top of the current tick epidemic we seem to be having. I purchase this to spray on my dog’s coats. It keeps their fur soft and skin beautiful. I also use it as a flea repellent as I never use chemical products. I myself use Neem Cream. So good for my skin especially in itchy area or areas likely to become sweaty! Easy to use and very effective at keeping ticks etc off my dogs.